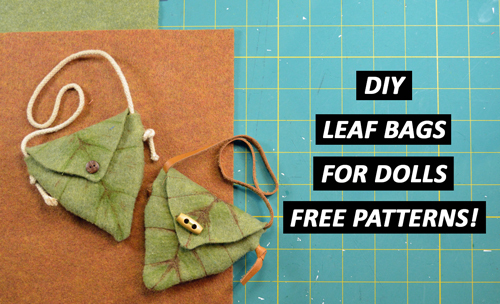 DIY Leaf Bag for Dolls – FREE Patterns included! Learn how to make an adorable little leaf bag for your elf or fairy to store their treasures in! This video will show you how to make leaf bags for your 14 – 20 inch dolls. FREE patterns included! QUESTION — Have a question about KeLibu Patterns, this video, or Anything Else? Post in comments section of this video! DISCLAIMER: This video and description contains affiliate links, which means that if you click on one of the product links, I’ll receive a small commission. This helps support the channel and allows me to continue to make videos like this and new patterns. Thank you for the support! First – the idea! wonder-filled; what simple achievable creativity you share with us, and how eager we are to learn from you, because you are trusted! What you show us WORKS for us, as absolute beginners. Second – the quality of video-making – I feel I am watching me doing it, perfect positioning to help us all, and all your movement so clear, you take away any puzzlement, fee us up to have a go without trepidation! Third – the links galore so you don’t hesitate, thinking “I don’t know where to look for something like that”; much appreciated. Finally, the MANY tips you give us. What a teacher you are! Thank you SO much. Wow, I love this. Never thought about a bag like this but so glad you did! I think its very special and would love to make an autumn one too. I’m glad you like them Carmen. I want to make an autumn one as well. How do you download this pattern? Hi Christine. You need to click on the link and then on the thumbnail picture. Once you click on the picture it should bring up the file as a full sized PDF for you and then you can “Save As”. Let me know if you have any trouble. Thank you–that is so cute and great directions too! Thank you Dori. I’m glad you liked it.